Welcome to the world of Life Siphon. You find yourself dropped into a mystical and sinister world that is not very hospitable to humans. 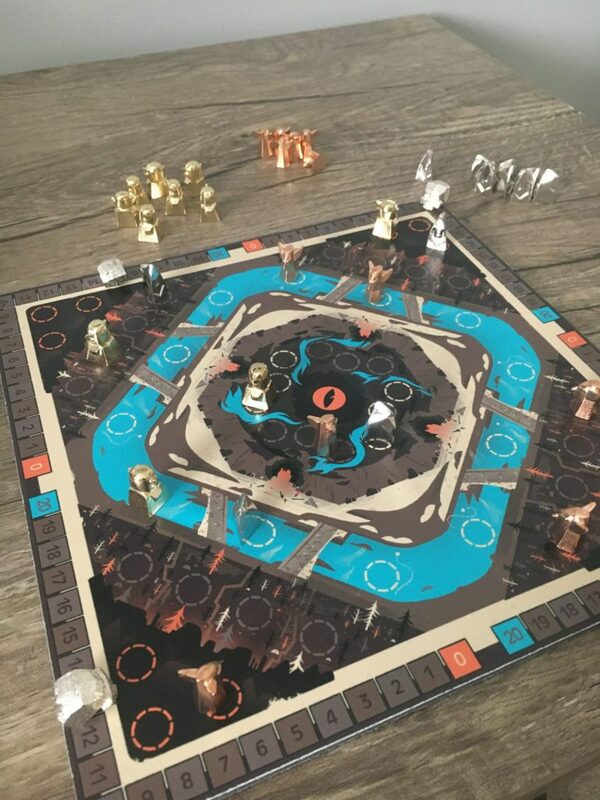 Set after the events of the previously released game, Dragoon, the world has been overrun by dragons and you find yourself forced deep underground for safety. While there, you uncover a dark chest that of course you open because what could go wrong. Now you’re cursed, and the only cure is to give in to the blood lust and kill your friends… but don’t feel too bad, they are cursed too and you’re all out for blood! In this battle royale, there can be only one champion. You must use your wits, summon monsters and cast spells to outwit and outlast your opponents. Disclaimer: Meeple Mountain was provided a pre-production copy of the game. It is this copy of the game that this review is based upon. As such, this review is not necessarily representative of the final product. All photographs, components, and rules described herein are subject to change. The main way you will lay waste to your opponents is by attacking them with familiars. There are three different ones you can summon (though I hear there could be even more from stretch goals) each with their own unique stats and abilities. All of these familiars cost life to summon so you are always weighing the cost to get more units on the board. Speaking of the board, each player’s area is comprised of essentially 4 “areas” where your familiars go. The furthest area in the back is where your familiars are summoned from. Next up is a movement or holding area. After that is the river. This area is very important as on your turn you heal 1 health per familiar that is in the river. Finally, you have the battle ground. This is the area that allows you to attack the player to your left as well as defend attacks from the player to your right. Positioning is key in Life Siphon as you have to plan ahead to get minions to the river to keep your life up while also having some heavy hitters in the battleground to soak damage or attack others. Combat also provides you with some tough choices. In combat the defender can choose to block the attack with any familiars in their battleground or simply take the damage. This requires both parties to plan for how to slip damage past a defender or if it is worth losing a familiar to get rid of one of their opponent’s. There is one exception to this rule which is the familiar: the litch. If you attack with the litch, YOU get to decide if you are attacking the opponent directly or if they can choose to block. This familiar is quite a tricky guy to handle and added a great layer to Life Siphon. The last major aspect to Life Siphon is the spells you can play. There are two types of spells: fast, which can be played quickly at any time (tricky, right?) and slow, which can only be played on your main phase of your turn. These spells perform a wide variety of functions from moving or buffing familiars to unique actions such as stealing life or cards from opponents. The cards usually have a life cost associated with them so, again, it is important to plan your spells carefully so you do not dig your own grave. I love that in Life Siphon you can only draw a new spell if you have no familiars in the battleground area. This is such a great feature because it forces you to plan your moves to make sure you do not become spell starved and can even incentivize you to let familiars die just to get more cards in hand. This small subtle rule is very impactful to the tactical aspect of the game. Life Siphon plays relatively quickly in easy to understand rounds with each player summoning, moving, attacking or playing spells until only one cused player remains alive. The game is easy to teach and even light gamers can pick it up quickly. The beauty in Life Siphon is that it’s simple to understand and much more challenging to master. On any given turn there are several things that would be beneficial to do but you must always be weighing the cost on your life as you try to figure out when to attack or defend, when to draw spells or how many familiars to keep in the river to keep your health up. The subtle intricacies of Life Siphon are what make it so fun and a welcome addition to any collection. I have said all of this and have not even touched yet on one of my favorite things about this game, which is its table presence. 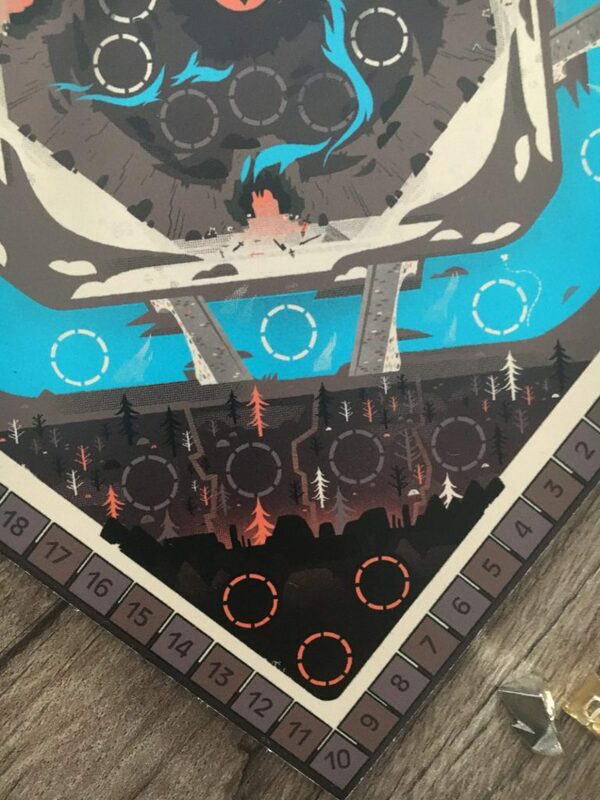 This game is, by far, one of the prettiest prototypes I have ever seen and I can only believe the final version is going to be even better. I was fortunate to play with the metal pieces and they really bring the board to life and make the game sparkle. Literally. 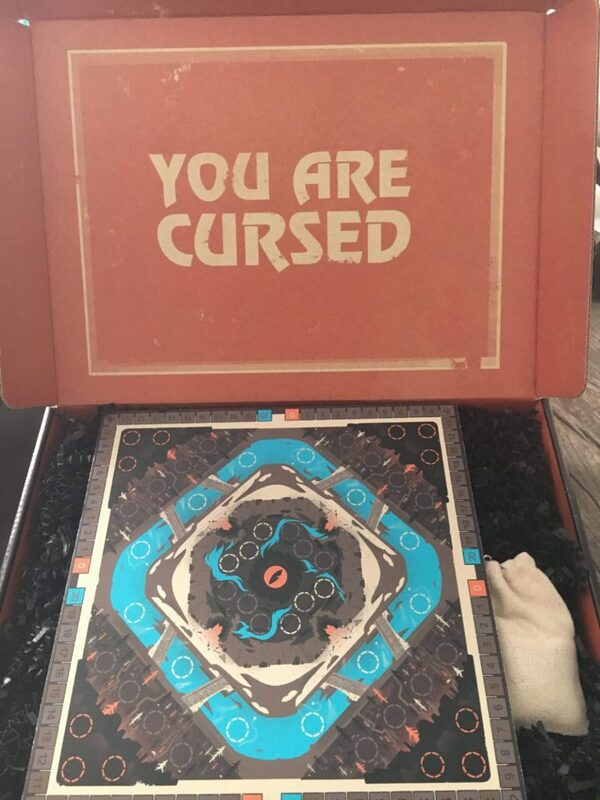 Simple things like how the box is packaged and the Dark Souls-eqsue “You are Cursed” in the inside of the box all add to to the beautiful theme and lore the designers have created with this ongoing series of games. In terms of drawbacks to this game I do not have a lot to comment on. I personally love how you can only attack one player. This keeps the game more fair and prevents “gang up” mentality, but I could see how that could be frustrating to some if one player is just insanely far ahead. While I only played a few games I do see where if you played with the same group frequently you may find the replayability to be diminished by finding “favored” tactics or play styles but that is a marginal complaint and with all the Kickstarter goodies coming along I believe this concern is even less important. 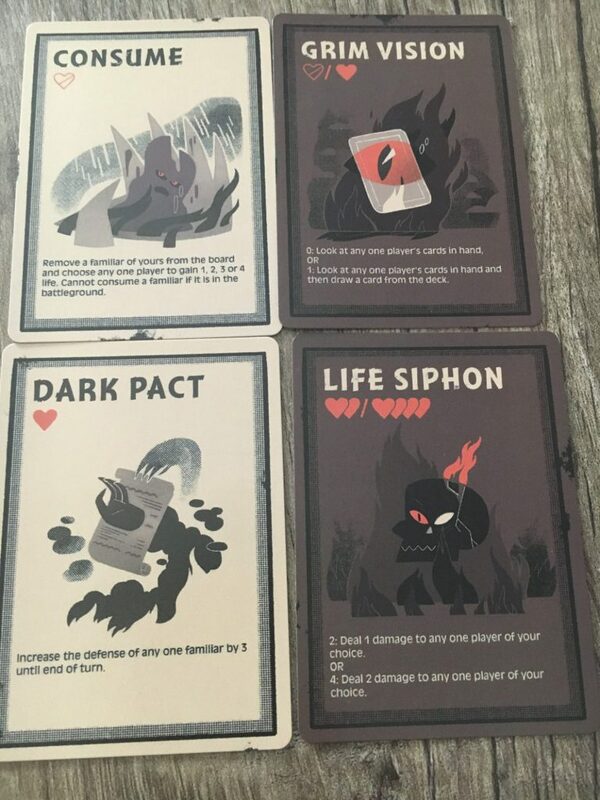 Life Siphon is a very fun and imaginative game of combat where your actions cost you the very asset you want to protect. This give and take as you seek victory is fun and offers a lot of tough choices that I find absolutely exhilarating in a game. You are forced to weigh each action and its life cost, as even if you beat the player to your left you, have to deal with the next guy. So rushing, while fun, can be disastrous. Every game felt close and came down to the wire which is a sign of deep playtesting and thoughtful balancing. If you are looking for a new and imaginative PVP game that has a touch of evil and a bit of tactics to it, Life Siphon is just the game for you! Next postGartenbau Review: How Does Your Garden Grow? Masters Student and Performance Coach. Husband to 1 and Father to 3....cats. My singular hobby/passion is board games.